The small community of Riggins offers several lodging options. Many of the hotels are within walking distance to restaurants and shopping. Camping is available in the Nez Perce-Clearwater National Forest or privately owned campgrounds in town. Find where to stay in Riggins. Canyon Pines RV Resort. Located 9 miles south of Riggins on Highway 95 at mile post 185 at 159 Barn Road, Pollock, ID 83547. Phone: 208-628-4006. E-mail GPS: 45.1741 N; 116.2129 W.
Nez Perce-Clearwater National Forest. Salmon River Ranger District/Slate Creek Ranger Station: 304 Slate Creek Road, White Bird, ID 83554. Phone: 208-839-2211; Fax: 208-839-2730: Reservations: 1-877-444-6777. Fish Creek Campground: Located 8 miles south of Grangeville of Forest Road 221 and situated in the middle of 4-season recreation area. 11 sites (tents and RV's), vault toilets including 2 ADA, drinking water, concrete walks provides access to Fish Creek Pavilion, paved circular bonfire area and camp host during open season. Nearest town is Grangeville, ID. Elevation: 2,300 - 5,000 feet. GPS: 45.8582; -116.07747. 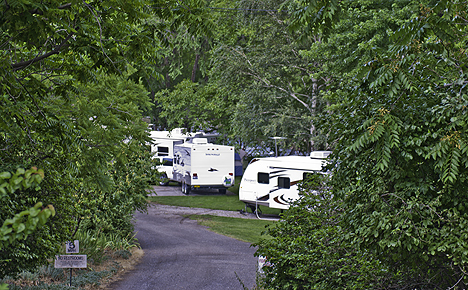 Fish Creek Group Campground: Located 1 mile south of Fish Creek Campground. up to 75 people, no drinking water and 1 vault facility. This dispersed campground has no electricity, water or sewer hookups. Nearest town is Grangeville, ID. GPS: 45.8424; -116.1124. Iron Phone Junction Dispersed Campground: Located off Forest Road 241. 4 tent sites with fire rings, hitching rails and feed bunks, vault toilet and no drinking water. GPS: 45.5396; -116.4127. North Fork (Slate Creek) Campground: Located on Forest Road 354. 5 campsites, picnic tables, fire rings, no drinking water and vault toilet. Nearest town is White Bird, ID. Elevation: 3,000 feet. GPS: 45.64258; -116.11388. Papoose Camp: 4 tent sites or 2 travel trailers up to 18 feet, roadside picnic table and fireplace, vault toilet and no drinking water. Rocky Bluff Campground: Located on the cusp of Gospel Hump Wilderness. 4 campsites with parking, picnic tables, fire rings, no restroom and no drinking water. Nearest town is Grangeville, ID. Elevation: 5,200 feet. GPS: 45.63737; -116.00952. Seven Devils Campground: Located 1 mile south of Riggins and adjacent to Seven Devils Lake. 6 tent sites or 5 pickup camp sites, vault toilet and no drinking water. Nearest town is Riggins, ID. Spring Bar Campground: Located on Forest Road 1614 (Salmon River Road). 14 tent sites with picnic tables and fire places, drinking water during open season and vault toilet. Nearest town is Riggins, ID. Elevation: 1,740 feet. GPS: 45.43112; -116.14257. Van Creek Site: Located off Forest Road 1614 (Salmon River Road). 2 tent sites, no drinking water and vault toilet. Nearest town is Riggins, ID. GPS: 45.4254; -116.12249. Windy Saddle Campground: Located 1 mile south of Riggins in the foothills of the Seven Devils Mountains. 6 tent sites, no drinking water and vault toilet. Nearest town is Riggins, ID. GPS: 45.883; -115.0423. Riggins Motel. 615 S. Main Street, PO Box 1157, Riggins, ID 83549. Phone: 208-628-3001; Toll-free: 1-800-669-6739. The Riverview Motel. 708 N. Highway 95, Riggins, ID 83549. Phone: 208-628-3041; Toll-free: 1-888-256-2322. Salmon Rapids Lodge. 1010 S. Main Street, PO Box 408, Riggins, ID 83549. Phone: 208-628-2743; Toll-free: 1-877-957-2743; Fax: 208-628-3834. 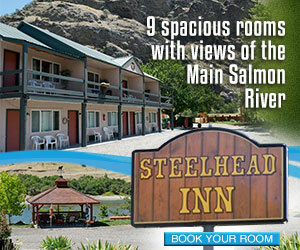 Salmon River Motel. 1203 S. Main Street, PO Box 196, Riggins, ID 83549. Phone: 208-628-3231. 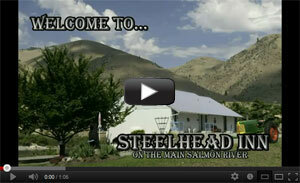 You also can try the Steelhead Inn located 15 minutes north of Riggins: 12212 Highway 95 South, Lucile, ID 83542. Phone: 208-628-4279.